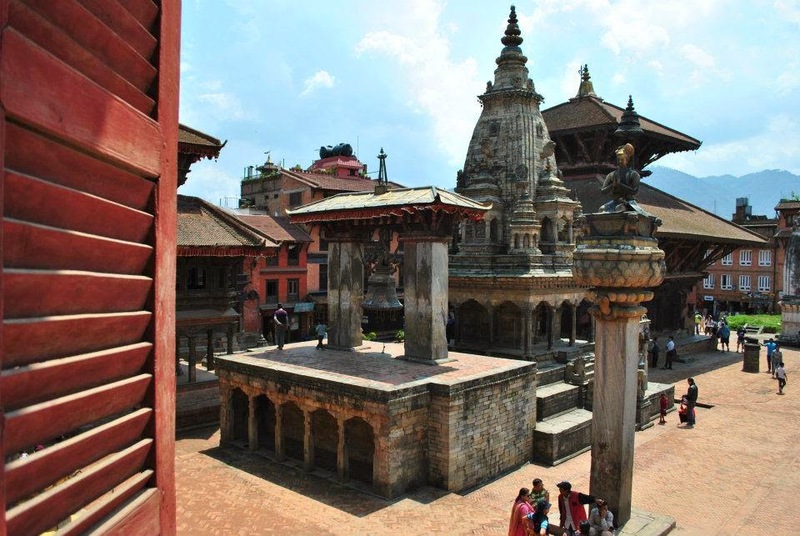 This is a picture of the Bhaktapur Darbar Square from my trip to Nepal in April 2012. Exactly three years ago. I was lucky to have visited this beautiful country and to have been witness to Kathmandu's wealth in terms of culture and heritage. As we speak, these centuries-old structures have been wiped out. The earthquake that so many feared for so many years hit Kathmandu on 25th April 2015. The death toll has been steadily on the rise and stands at 4,400 (according to CNN) and has left 8 million affected. As an economy which heavily depends on tourism, I want to encourage you to continue to maintain Nepal on your travel bucket list. 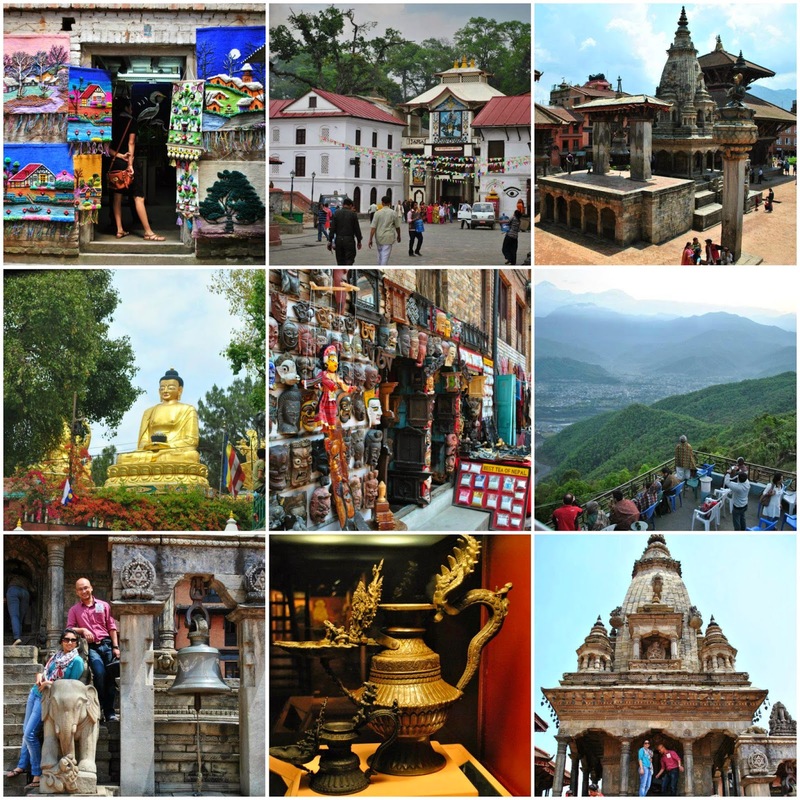 Below, I recount some faded memories from my 2012 trip where I spent an overwhelmingly amazing trip touring Kathmandu and Pokhara. I never anticipated Kathmandu to be the tourist-haven it is. We went shopping in Thamel, a thriving tourist hotspot, sipping on hot coffee along the way. April is peak season, so we found Kathmandu to be flocked with tourists! 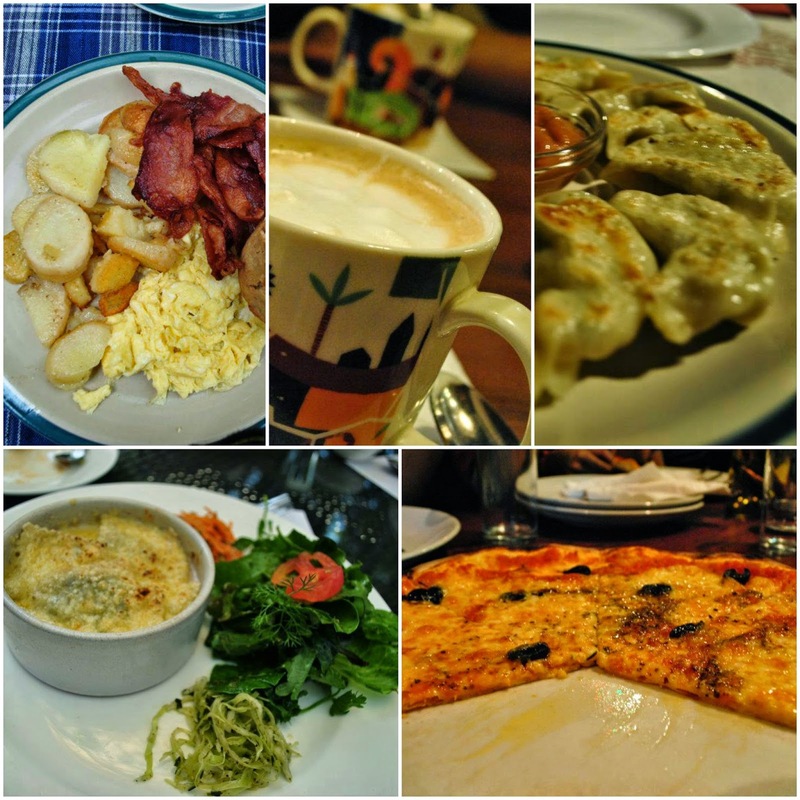 We had some of the most memorable meals there - a fulfilling 'Country Breakfast' at Mike's Breakfast, some prawns and baked cheesy ravioli at Le Sherpa, cheesy Italian Margarita at the very popular and buzzing Fire and Ice (it used to also be visited by the Royals), hot cuppa at the Patan Darbar Museum cafe and Kokito Coffee at Cafe Kaldi. We also did the tourist-y sightseeing and visited Patan Darbar Square, where we picked up some lovely pashmina shawls. We toured the Bhaktapur Darbar Square and bought some little souvenir masks. We offered our prayers at the Boudhanath Temple and the Pashupatinath temple. The latter is also where Hindu cremations take place and the smell of burning wood was prominent in the air. We joined the 'Ooohs' and 'aahs' of fellow tourists marvelling the view of the sunrise at Sarangkot, the orange ball of fire slowly rising up from behind the Annapurna ranges. I also had an overnight stay planned at Pokhara. To keep me company on my bus journey from Kathmandu to Pokhara was a very interesting book on the royal family of Nepal. It delved into the mindset of the Crown Prince Dipendra and what prompted him to go on a killing spree in 2001 where he took away the lives of his own parents, his siblings and cousins and finally himself. I made a mental note to visit the Narayanhiti Palace Museum, also the scene of the massacre. The view from my hotel in Pokhara as I gathered was the landing strip for para-gliders - right outside my room! I still remember my eyes half open seeing the colourful fabric wings of the para-gliders smoothly gliding past the blue sky and landing on the grassy open space near the lake. What peace they would be experiencing up there - it was with this thought that I gathered enough courage to go tandem paragliding. 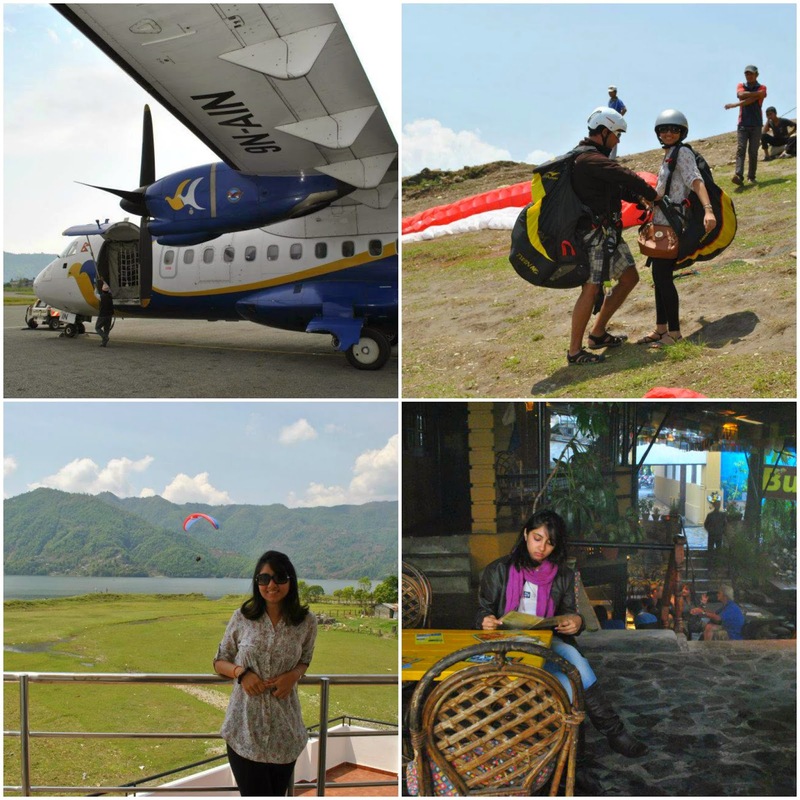 I consider it one of the bravest things I have done as I am not an adventure freak. We also spent the day roaming the streets of Pokhara lined with lovely cafes that served hot popcorn as you waited for your food to arrive. Not anticipating rain, we went umbrella-hunting as well. We saw lots of expats who called Pokhara their home for months, many of them on a spiritual retreat, volunteering or just backpacking. The night in Pokhara was fairly dark and isolated and we spent it in our hotel room watching the rain pelting down through our sheer curtains. On my return from Pokhara by the local Buddha Air, I finally got the chance to do this on a day when there was a bandh in the city. The Palace was well maintained and a huge attraction for tourists. Inside, we got a glimpse of the privileged life once led by the Royals. We were led from room unto room marvelling at the glass chandeliers, opulent furniture, cabinets full of exotic gifts from Head of States across the world, elaborately woven carpets, priceless jewels, among other eclectic collections. The rooms where the massacre happened were bulldozed down, so all that is left of it are boundaries marked with bricks. You will see signboards indicating the spot where the Prince shot his family and himself. To be there and think of the terror that befell the Royals that night is stomach-churning. Just like my stomach churns now at the thought of the millions who are suffering after Saturday's earthquake and the consequent aftershocks. I have made a modest donation to the Prime Minister's National Relief Fund and I urge you to do the same. Using insights from this Time magazine article and this Conde Nast Traveller India article, below are the different ways you can make a donation to help Nepal. 4. Nepalese designer Prabal Gurung's Shikshya Foundation: He set up his own crowdfunding project, which has raised $315,098 already. The target was initially $250,000 and is now set at $500,000. This money will be used by the Shikshya Foundation, Nepal, for relief work. 1. Paytm: Donate from Rs.10 to Rs.10,000 through your digital wallet. Paytm will match every rupee donated and direct all the funds to quake relief in Nepal. 2. Uber: Use the promo code HELPNEPAL for your next ride to donate Rs.10. Uber will match the amount collected and funnel all proceeds to the Prime Minister’s Relief Fund. Among the poorest countries in the world, Nepal is an economy that thrives heavily on tourism. So this earthquake's effects will be lasting. Lots of the UNESCO World Heritage listed sites in Kathmandu have been destroyed and rebuilding them might be an impossible and expensive feat. This drone footage of the devastation is heartbreaking. In a year or two, we hope that life would come back to normal and basic infrastructure would be restored. The country is a wealth of natural beauty and this is a lot that is left to be explored.